alaTest har samlet og analyseret 6 anmeldelser fra magasiner og hjemmesider. Anmeldere kan virkelig godt lide skærmen. Også værdien for pengene imponerer, men mange er mindre positive med hensyn til kvaliteten. Vi analyserede bruger- og ekspertratings, produktalder og andre faktorer. 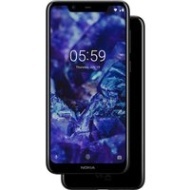 Sammenlignet med andre Mobiltelefoner får Nokia 5.1 Plus / Nokia X5 (2018) en samlet alaScore™ på 93/100 = Fremragende kvalitet. Fratricide? The Nokia 5.1 Plus not only performs better than the Nokia 5.1 but also better than the Nokia 6.1, despite what Nokia's number system may have led you to believe. In-house competition or just confusing numbers? After launching the Nokia X5 and X6 in China earlier this year, HMD Global has revealed that they'll be available in the rest of the world under different names. Both phones are Android One devices, which means they’ll run near-stock Android software. They’re both expected to ship with Android 8 Oreo, but an Android 9 Pie update is expected in the coming months. Brudermord? Das Nokia 5.1 Plus ist kein leicht verbessertes Nokia 5.1, denn es liegt leistungsmäßig deutlich vor diesem und lässt sogar das Nokia 6.1 knapp hinter sich. Konkurrenz im eigenen Haus oder doch nur Zahlenverwirrung?